Let’s take a quick personality test. Are you the type of person who likes to solve problems by analyzing clues, collecting information and methodically reaching your goal? Or are you more the type to thrust a double-footed kick into someone’s face and follow it with a few body blows? Your answers to those questions should help you decide which popular game to choose this week. 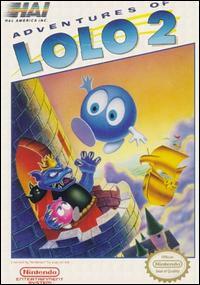 ADVENTURES OF LOLO 2 (NES, 1 player, Rated E for Everyone, 500 Wii Points): Lolo and Lala are back in this sequel to the popular puzzle game THE ADVENTURES OF LOLO. On their return from the Haunted Castle, the Great Devil kidnaps Lala and challenges Lolo to rescue her again. Now he must take on the challenge of the Great Devil’s Tower and Castle mazes. Fortunately, Lala was able to analyze each of the mazes as she was taken to the tower and left clues in the Jewel Boxes in each room. Each Jewel that Lolo collects contains information that will help him in the next room. In order to succeed, he’ll also have to push tiles, pick up Heart Framers, temporarily turn enemies into Eggs with his Magic Shots and ward off enemy attacks by moving Emerald Framers. With your help, Lolo and Lala will work together to escape the Great Devil’s clutches and defeat him. SUPER STREET FIGHTER II: THE NEW CHALLENGERS (Super NES, 1-2 players, Rated T for Teen – Violence, 800 Wii Points): When SUPER STREET FIGHTER II: THE NEW CHALLENGERS debuted, the fighting-game genre was forever changed. Along with a revolutionary combo system, the game introduced a new set of challengers to fight alongside the original Street Fighter II cast. In addition to the classic characters of Ryu, Ken, Chun-Li, Guile, Blanka, E. Honda, Zangief, Dhalsim, Balrog, Vega, Sagat and M. Bison, take control of four brand-new characters in exciting head-to-head fighting game play. Choose T. Hawk and his unmatched strength to crush your opponents, use Deejay’s unrivaled kickboxing ability to defeat your opponents, unleash your inner dragon with the furious kung fu of Fei Long and drill your rivals with the deadly beauty of Cammy. Get ready for the Street Fighter tournament and the fight of your life.